In nine days, discover the red rose city of Petra, follow the King’s Road and visit the stunning Kerak crusader castle, float in the Dead Sea or bathe with colourful fishes in the Red Sea and step back into time for 4 days, hiking in the Wadi Rum desert, camping with Bedouins at different spots every night, in the nomadic “mode”. Departures guaranteed for a minimum of 4 participants. Departures guaranteed from 2 participants with overnights in our fixed bedouin camp during the trail and adapted itinerary. Arrival at the airport, where your driver will meet you. Then we will drive you to your 3* hotel in Amman/Madaba in a 3* hotel. From Madaba we will travel to the Dead Sea where you will bathe and enjoy the famous floating experience in the lowest point of the earth, then we will drive you to Mount Nebo where you will have a magnificent view of the Jordan valley and the Holy Land. You will take lunch in Kerak where you will also visit the crusader castle. We continue along the King’s Road to reach Petra at the end of the afternoon. Dinner and overnight in your 3* hotel by the entrance to the site. You will have a full day to discover the red rose city of Petra, built by the Nabateans, including a private four hour guided tour with an English-speaking guide. You will also have free time to explore Petra, for example you can walk further along through the sit to climb to the monastery. There are cafes within the site for your choice of lunch. After the tour of Petra you will sleep another night in your hotel in Petra before transferring to Wadi Rum to begin your camel trek. 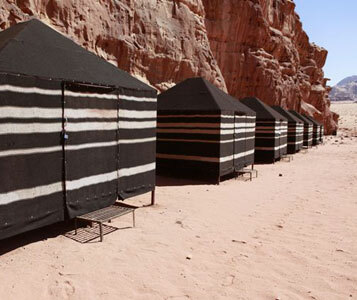 You will leave Petra after breakfast and drive one and a half hours to arrive in Wadi Rum village where we will meet you at Jordan Tracks office for tea and introductions with your Bedouin guide. The first stage of your trek starts in the Um Ishreen valley, and on our journey today we will see the Nabataean inscriptions of An Fashiye and the red sand dune. Our destination: Barragh canyon. You will spend the night in a bivouac camp at the entrance of the canyon. After breakfast we cross Barragh canyon with a stop at the ancient Nabataean well, still used by the Bedouins to water their goats and camels, and where you can listen to its extraordinary echo feature! In the afternoon we walk across the white sands of the Um Alouan valley to reach the mountain Jebel Burdah. You will spend the night in bivouac at the foot of the mountain and its well known natural arch rock bridge. This morning we climb Jebel Burdah to arrive at the famous arch. This stage takes around 3 hours, part of the ascent is exposed and the climb is optional. We leave this to the discretion of you and your guide. We then cross the narrow canyon of Fara ati CHaibh, visiting Um Fruth rock bridge before heading up to the Um Sabath mountain range. Bivouac in Um Sabath valley, appreciating the exceptional sunset panorama that it offers. Last morning of trek in the spring area of AlQatar. In the afternoon you will transfer from Wadi Rum to Aqaba, the southernmost point of Jordan on the shores of the Red Sea. Dinner in Aqaba will be taken in the well-known Ali Baba restaurant, famous for its special local dish sayadiyah, prepared with fresh fish from the Red Sea, and rice. Overnight you will stay in central Aqaba in a 3 star hotel with its own swimming pool. You are free to spend the morning at leisure – take your time to go shopping or spend the morning at the beach. In the afternoon we will transfer you from your Aqaba hotel to Amman. Today we will transfer you to the airport at a convenient time for your flight back home. Our price for this tour is 820 JOD / person. Jordanian visa (40 JD/person at Amman airport). Lunchs & dinners + drinks.